Whether your looking for classic white quartz for a contemporary home, or giving your slope-side condo a rustic granite counter-top resurfacing, we craft with the finest natural stone on the market. 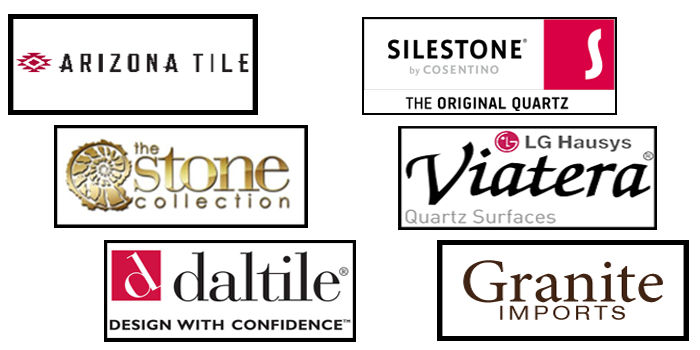 The breadth of our product inventory is enabled by partnering with top stone importers. View our Design Process to see how we approach each custom project. From traditional to contemporary, we can provide the selection assistance to determine what fits your project design and budget. Please view a few examples of granite and quartz stone options we offer. These are only a few of the many products available to you and a fraction of what we can offer through our importers & distributors. For full partner product lines please visit the websites listed below to browse complete product inventory and design styles. We also offer a wide array of marble, soapstone, travertine, and manufactured stone surfaces ideal for various kitchen & bath applications.